A forklift brings the Grandby up toward the truck. While I took this shot, I pretended that I wasn’t concerned about the changes in tilt that the driveway presented. Installation day for the Grandby turned out to a unique experience. I got up at 5 AM in order to leave at 6:30 and hopefully arrive at Adventure Trailers by 11 AM. 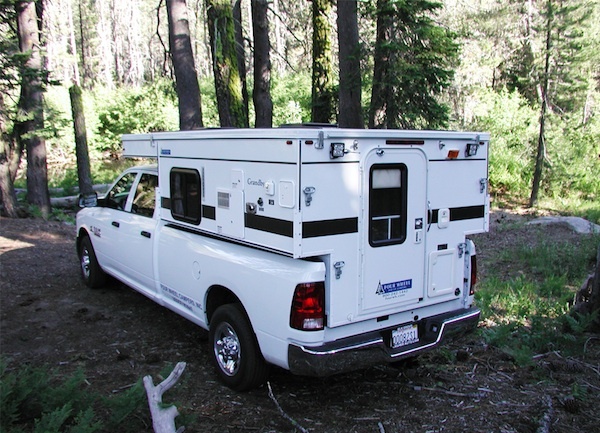 I just assumed that installation would take a couple of hours to drill the truck’s bed for hold-down hardware, and to run wires from the battery back to the camper’s power cord. I actually left at 6:45 and booked it to try to compensate for the time lost on the 4-1/2 hour drive. It’s a technical 4 hours of driving, but between stoplight delays on-route, and fuel and potty stops, it adds up. Thanks largely to my Bank of America credit card throwing a hissy fit due to “unusual activity” caused by my traveling stops here and there, I didn’t arrive at the Prescott dealership until 11:25. When I hadn’t shown up by 11:15, they called just to make sure I wasn’t still asleep in Yuma, but they were not booked such that my delay would cause any issues for them. For the amount of business they do, their facility is a bit tight, but gets the job done. One look at the lot shows that they also use what they sell. Overland Journal has an office opposite Adventure Trailers’ office. That’s a glossy, high-end photographic rag that covers vehicle travel all over the globe, and the effort that takes limits them to five issues per year. It’s an interesting magazine.